Dead Sea scrolls: In the red part, "habitats that would normally be teeming with life become, essentially, biological deserts," NOAA says. NOAA. First, the good news: The annual "dead zone" that smothers much of the northern Gulf of Mexico—caused by an oxygen-sucking algae bloom mostly fed by Midwestern farm runoff—is smaller this year than scientists had expected. In the wake of heavy spring rains, researchers at the National Oceanic and Atmospheric Administration had been projecting 2013’s fish-free region of the Gulf to be at least 7,286 square miles and as much as 8,561 square miles—somewhere between the size of New Jersey on the low end to New Hampshire on the high end. Instead, NOAA announced, it has clocked in at 5,840 square miles—a bit bigger thanConnecticut. It’s depicted in the above graphic. Now, for the bad news: this year’s "biological desert" (NOAA’s phrase) is much bigger than last year’s, below, which was relatively tiny because Midwestern droughts limited the amount of runoff that made it into the Gulf. 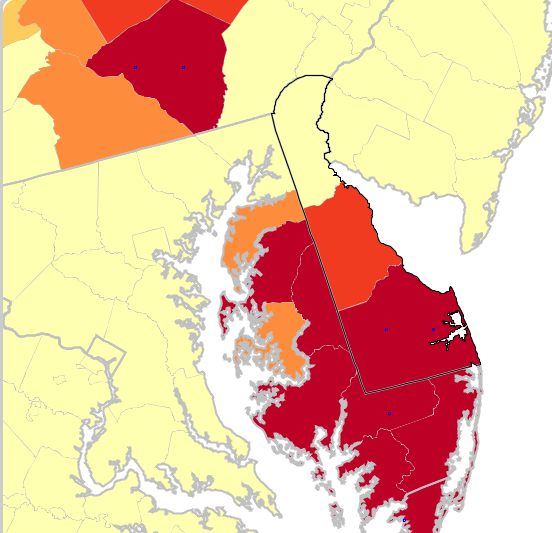 At about 2,900 square miles, the 2012 edition measured up to be about a third again as large as Delaware. Smaller than expected though it may be, this year’s model is still more than twice as large as NOAA’s targeted limit of less than 2,000 square miles. 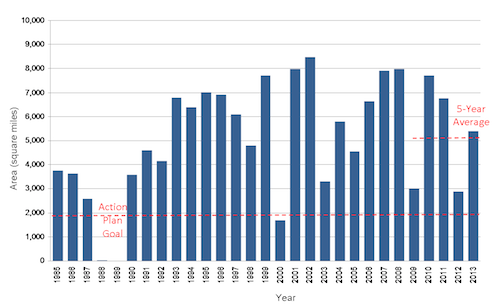 Here’s how recent dead zones stack up—note that the NOAA target has been met only once since 1990. Low years, like 2012 and 2009, tend to marked by high levels of drought; and high years, like 2008, by heavy rains and flooding. Why such massive annual dead zones? It’s a matter of geography and concentration and intensification of fertilizer-dependent agriculture. 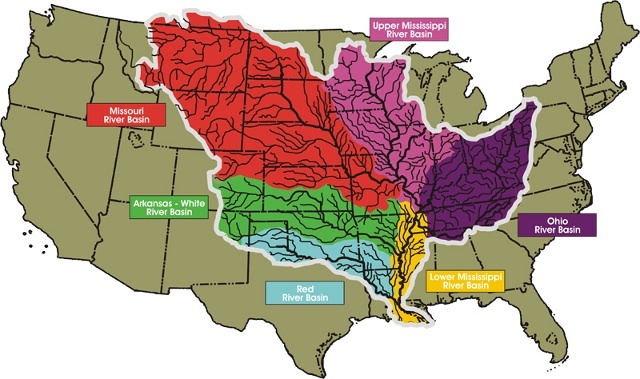 Note that an enormous swath of the US landmass—41 percent of it—drains into the Mississippi River Basin, as shown below. It’s true that even under natural conditions, a river that captures as much drainage as the Mississippi is going to deliver some level of nutrients to the sea, which in turn will generate at least some algae. But when US Geological Service researchers looked at the fossil record in 2006, they found that major hypoxia events (the technical name for dead zones) were relatively rare until around 1950—and have been increasingly common ever since. The mid-20th century is also when farmers turned to large-scale use of synthetic fertilizers. Now as much a part of Mississippi Delta life as crawfish boils, the Gulf dead zone wasn’t even documented as a phenomenon until 1972, according to NOAA. The very same land mass that drains into the Gulf is also the site of an enormous amount of agriculture. The vast majority of US corn production—which uses titanic amounts of nitrogen and phosphorus, the two main nutrients behind the dead zone—occurs there. The region is also where we shunt much of our factory-scale meat farms. This Food and Water Watch map depicts concentration of beef cow, dairy, hog, chicken, and egg farms—the redder, the more concentrated. Big Ag interests like to deflect blame for the annual dead zone, claiming that other factors, like runoff from lawns and municipal sewage, drive it. But the US Geological Service has traced flows of nitrogen and phosphorus into the Gulf, and there’s no denying the link to farming. "In total, agricultural sources contribute more than 70 percent of the nitrogen and phosphorus delivered to the Gulf, versus only 9 to 12% from urban sources," USGS reports. The Gulf isn’t the only water body that bears the brunt of our concentrated ag production. Much of the eastern edge of the Midwest drains into the Great Lakes, not the Gulf. And they, too, are experiencing fertilizer-fed algae blooms—particularly Lake Erie. The below satellite image depicts the record-setting, oxygen-depleting bloom that smothered much of Lake Erie in 2011, which peaked at 2,000 square miles (about Delaware-sized). 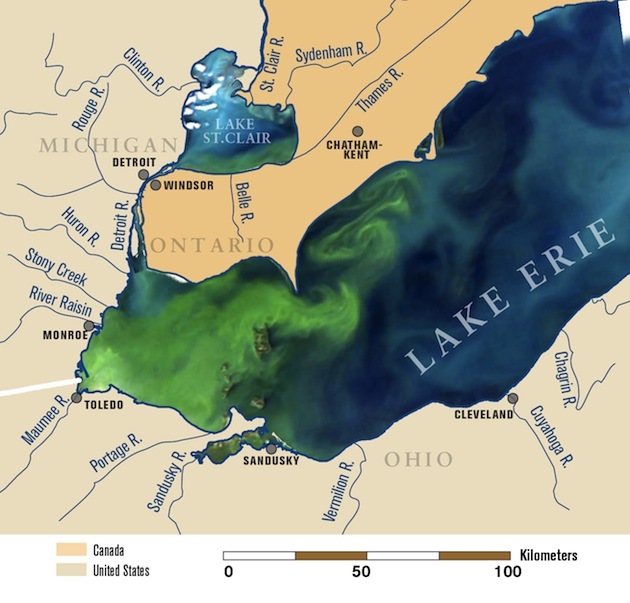 "That’s more than three times larger than any previously observed Lake Erie algae bloom, including blooms that occurred in the 1960s and 1970s, when the lake was famously declared dead," a University of Michigan report found. The culprit: severe storms in the spring, plus "agricultural practices that provide the key nutrients that fuel large-scale blooms." All of which raises the question: Are dead zones inevitable, a sacrifice necessary to feeding a nation of 300 million people? Turns out, not so much. A 2012 Iowa State University studyfound that by simply adding one or two crops to the Midwest’s typical corn-soy crop rotation, farmers would reduce their synthetic nitrogen fertilizer needs by 80 percent, while staying just as productive. And instead of leaving fields bare over winter, they could plant them with cover crops—a practice that, according to the US Department of Agriculture, "greatly reduces soil erosion and runoff" (among many other ecological benefits)—meaning cleaner streams, rivers, and ultimately, lakes, bays, and gulfs. Moreover, when animals are rotated briskly through pastures—and not crammed into factory-like structures where their manure accumulates into a dramatic waste problem—they, too, can contribute to healthy soil that traps nutrients, protecting waterways from runoff.